Microsoft's Windows operating system runs maintenance tasks including disk analysis and defragmention regularly on its own. Most Windows users and administrators don't need to run these manually anymore, but there are cases where you'd like to do so. I checked Optimize Drives recently and discovered that Windows refused to run on two of the hard drives. 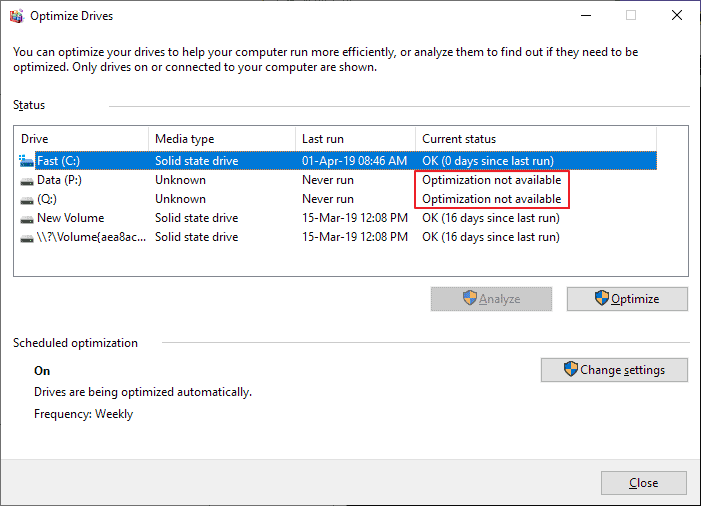 Windows displayed "Optimization not available" as the status, "unknown" as the media type, and "never run" as the last run date and time. You can access the Optimize Drives tool by right-clicking on a drive in Explorer, selecting Properties from the context menu, and opening Tools > Optimize. The analyze and optimize buttons could not be used in the window as they were not active. My first assumption was that this might have something to do with encryption, as both volumes were encrypted and only mounted when I needed to access data on them. Two solutions came to my mind: try the command line version of defrag to see if it would work, or use third-party defragmentation software like Smart Defrag, Vopt, Defraggler or Live Defrag. I decided to try the command line tool defrag first as it is a first-party solution. You need to launch an elevated command prompt to get started. If you are on Windows 10, use the shortcut Windows-X to display the "hidden" menu and select Command Prompt (Admin). You may also open Start on any version of Windows, type cmd.exe, right-click on the result, and select run as administrator to launch an elevated command prompt window. The core command is defrag and you may want to start running defrag /? to display all command options. Microsoft has a handy reference on the company's Docs website that explains each of the parameters and gives some examples. You may want to run an analysis first. The analysis returns the fragmentation status of the drive and gives a recommendation. The command analysis the fragmentation status of the drive P on the device. You need to change the drive letter if it is not drive P that you want to analyze. The command defrag c: /A would analyze the C drive instead. You may defragment the drive if the drive is fragmented, e.g. when Windows recommends that you should defragment the drive. The command runs the defragmentation operation on drive P. The parameters U and V echo progress and information on the screen while the operation takes place. You will notice that defrag runs fine on the drives even though Windows' "Optimize Drives" tool refused to run these operations. Tip: If you want to defrag SSDs, use the parameters /L and /O as well. It instructs defrag to run a trim command after the operation completes and to run the proper optimization for the media type. E -- To perform the operation on all drives except those that you specify. C -- To perform the defrag operation on all drives. X -- To consolidate free disk space on the volumes you specify. If Windows refuses to run defragmentation operations on a drive in "Optimize Drives", use the command line version of defrag instead to run the commands. Find out what you can do if the Windows "Optimize Drives" tool blocks defragmentation operations on selected hard drives. This isn’t the solution. “Optimization not available” refers to an hardware configuration issue. Make sure the drive is connected to the correct port and port type, check the BIOS or UEFI, and update the storage device drivers if necessary. All operating systems were up to date and configured in the same way (trim enabled, WinSAT ran, same driver versions, etc..). Another Microsoft’s baked “Utility” that isn’t worth the disk space and CPU it uses. I have 3 drives : C – SSD, D – 1TB HDD Internal, G – 3TB USB External. Optimize Drives run on G drive on Mar. 29 (status OK, 0 fragmented). My laptop in on 24/7 and G drive is in usage read/write 24/7 and is very much fragmented (11%). Just use 3rd party defrag app once in a while. Excellent. My brand new desktop with Windows 10 sees my conventional harddisk as a SSD and refuses to defrag. When googling you see occur this problem sometimes. This is just what I need. One caveat: you must write your drive letter in capital. So it is C, not c.
Hm, lower case drive letters work just fine on my W10 test machine. Sebas, you can go to Device manager > Disk drives and uninstall the driver for that drive. Restart your computer and now Windows should reinstall its driver. Whoever configured that PC probably used an image they created for a PC with a SSD and Windows decided not to adjust it to the newly discovered hardware. Thanks Yulia, appreciated. I will do that, when googling someone already mentioned to reinstall the driver. Yulia I reinstalled the drive, but to no avail. So for the time being I will use this solution. Make sure you don’t have any device showing a warning sign (it will show up in Device manager under a separate category, expanded by default), mainly the chipset driver. Other than that I don’t know.. well, other than Windows being Windows I guess. I encountered this once (stated above) and could not figure it out myself either. If You use a Samsung SSD You just have to use Samsung Magician’s ‘advanced optimization’ once: when installation of Windows + install of updates and other softwares are installed. A SSD doesn’t get fragmented as a mechanical drive. My computer with XP x64 and 7 x64 in dual boot is as fast today as it was three years ago (here i mean XP x64 – 7 x64 was re-installed earlier this year – i don’t let them see each other, therefor the optimization in Windows 7 didn’t affect the XP x64 partition). I use a third party SSD tool (SSD Tool 0.9.5 works in XP/XP x64) once a month to get rid of left clutter from deleted files. As i once stated some Windows services/tools that are used on mechanical drives should never be used on a SSD (even if todays SSD’s are better than they once were, each cell on a SSD still has a limited life). Heavy writings, saves and temp-files are on an external mechanical drive (USB 3.0) in my system. Hopefully this will make the SSD live longer than the computer itself. Are you using Vera Crypt? Did not work for SSD in VeraCrypt container. 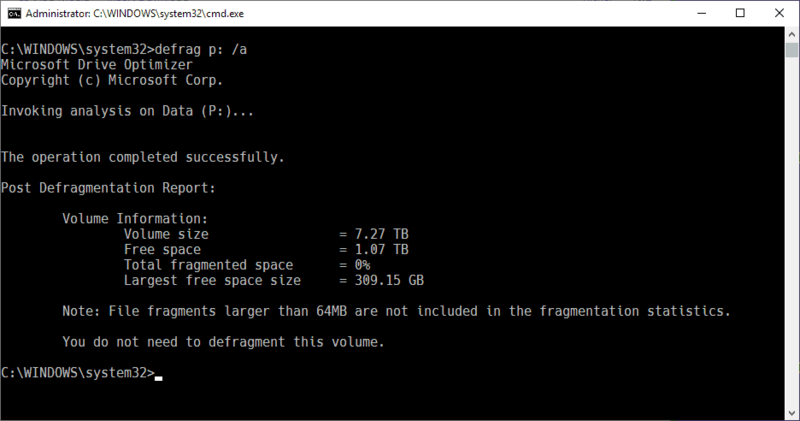 The regular defrag will work (as if it was a non-SSD, which is bad), but commands /L and /O won’t do anything. There was a glitch where Windows 10 would think you have an SSD when you actually have a Hard Drive or would think you have a Hard Drive when you actually have an SSD. This happened a lot when upgrading from Windows whatever to Windows 10. This issue is probably in the same glitch neighborhood…..